There are now 4 Summer Reading Programs linked on the Hot Chicks and Smart Men Dig Reading page. FOUR. I love it when good ideas spread - the point of origin for all these programs was Todd Wheeler's Virtual Summer Reading Program, and now there's five programs in total, all benefiting libraries and literacy. THIS is what the Internet is good for, people. Well, this and LOLZ cats. There's a boutique near the Big Yellow House called Parker Panache. I've been in a few times, but never bought anything because their merchandise is pricey, and I've always told myself that with my chronically fluctuating weight, I shouldn't spend that much on clothes. Instead I buy from Kohl's, and then give away garments as they become too small or too big. Here's the problem with that strategy. 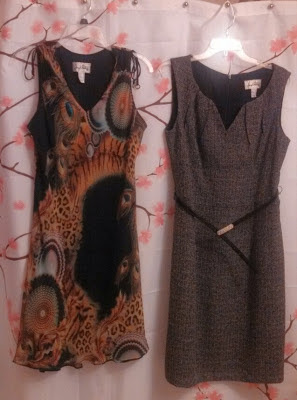 In spite of the fact that I buy "affordable" brands, I still end up spending a ton of money on clothes because I don't carry garments from one season to the next, and occasionally I ended up giving away an outfit that I just loved. Joseph Ribkoff is my new Platonic Boyfriend. Yay for rewarding readers! Also? I gave away all my "fat" clothes when I lost a decent amount of weight, then, when I gained it all back (of course!) had to borrow clothes from my mom (my MOM, oh the shame!) to wear at a fancy engagement party. I need a new clothes strategy, too. Megan, my new strategy is to NEVER THROW ANYTHING AWAY AGAIN. EVER. Now that the last of the kids is off the payroll, I've commandeered her closet and will have rack sections for every size, just like a department store. I love those two! I think that is a fine strategy indeed. That reminds me: You mentioned last time we met - actually, I think it was two times ago - that you were hoping to need those jeans and slacks back that you loaned me. Is that still on track? I am planning to take them (the slacks and dress anyway) to the dry cleaners the next time I go and will have them with me when we go to Helga's. Would that be OK? Anne, my progress has somewhat reversed, so no - feel free to keep wearing them. What is that . . . four or five platonic boyfriends? If you're not careful, you'll get a platonic reputation for getting around! Matt, I actually have an imaginary celebrity seraglio. I just tone it down for the masses. Celebrity seraglios are the best.